It’s one thing to be supportive of breast feeding, but the poor mom I talked to on the phone today recoiled in horror when I told her it would be better to supplement with formula rather then cow’s milk for her 9-month-old. You would have thought I suggested she poison the kid. She’s done a great job of feeding her baby, there’s no reason for her to feel the guilt she feels at supplementing with formula. Whoever decided that this issue needs to be so polarized owes me a sundae. I’m a Similactivist. I’m Similac Sensitive so thanks for letting me express my bottled up feelings on your wall. Just had to get it off my chest. I feel 2% better. I’m not having a cow, just milking the pun opportunity for all it’s worth. 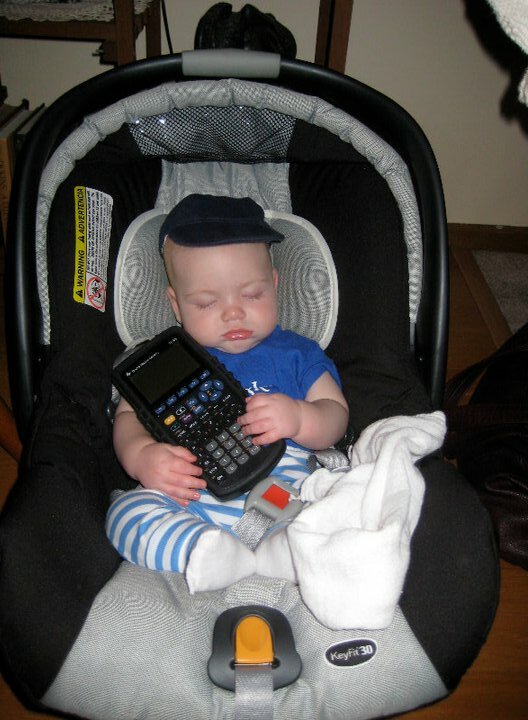 Since we’re on the topic, here’s a picture of Oliver working on his formula at a Nerd Party last year. one of the best posts ever. love it!!! Hey, I’m internet famous! Seriously, if I ever have another baby, I’m going to name it Similactivist, in honor of this post.